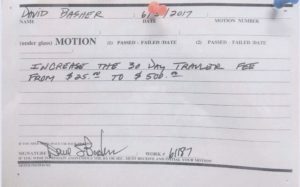 Local 23’s Business Agent, Dave Basher, posts Motion to raise Traveler Fee to $500/month. ILWU Solidarity, Local 23 style. 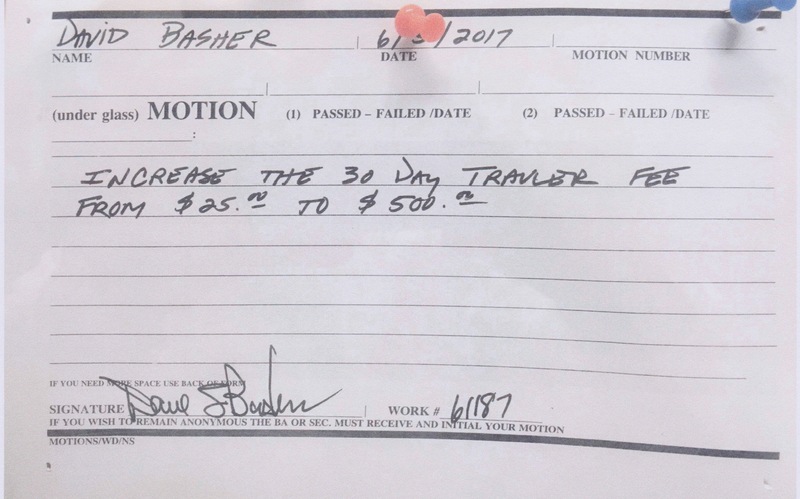 Local 23 Business Agent Dave Basher posted the following Motion to raise the fee charged to 30-day Travelers from $25 to $500 per visit. Apparently this is Basher’s idea of how to raise money to offset all the attorney’s expenses related to the recent NLRB charges filed against Local 23. It was Basher that prevented Eric from working at the SIM, and he lied saying the CLRC said he could not. It was Basher that decided to place members into 28-day treatment, with no training and no authority. It was Basher that refused to do anything to Scott Mason after he picked up and dropped a semi at Matson, injuring the driver. Now it is Basher that is shooting his mouth off about the money being spent to defend the Local from NLRB charges, filed by travelers like Karey Martinez. For that, he gets another NLRB charge. Have they thought about getting rid of Basher, as he is the one causing all the problems? Does Local 23 know what Solidarity means? Big Baby must be worried about the NLRB’s latest Complaint, he got his buddies at PMA to bring in the lawyers that wear the big underwear. Here is a copy of 19-CB-190139 and 19-CA-195788 Complaint and Hearing Order, issued by NLRB Region 19. Check out PMA’s answers to the Consolidated Complaint; PMA answer to complaint 19-CA-195788. Notice the law firm is from Washington D. C., that’s the firm that hires NLRB Board Members after they leave the Board. Not Board Agents, or Board Attorneys, but Board Members; those are what other lawyers call, the guys that wear the big under wear. That is a lot of horsepower, for a rather simple case involving a requirement that requires workers to exhaust the grievance procedure of the PCLCD before seeking any other remedy. Their defense is simple and interesting. The main claim is that the language has been in the Contract for decades and no one has had any problems with it. That is like claiming that you have been beating your wife for decades, and she has never complained. How do you think that will work with the Judge? Both the International and Local 19 are acting like the children that they are. Both refused to provide a copy of their answers, as is customary in these cases. Rob Remar, the International’s longtime attorney made no bones about it. He just flat out left me off the service list. Wonder if Big Baby told him to, or if he decided all on his own? Here is the copy that was provided by the NLRB; ILWU answer to complaint 19-CB-190139. Local 19 however, just flat out lied. They claim to have provided me with a copy, but did not send it. Wonder if they decided t do it on their own, or if Local 19 Chief Ball Washer, Rich Austin, told them to? Here is the copy that was provided by the NLRB; Local 19 answer to complaint 19-CA-190139. Typical Bart Simpson responses; I didn’t do it, nobody saw me, you can’t prove a thing. 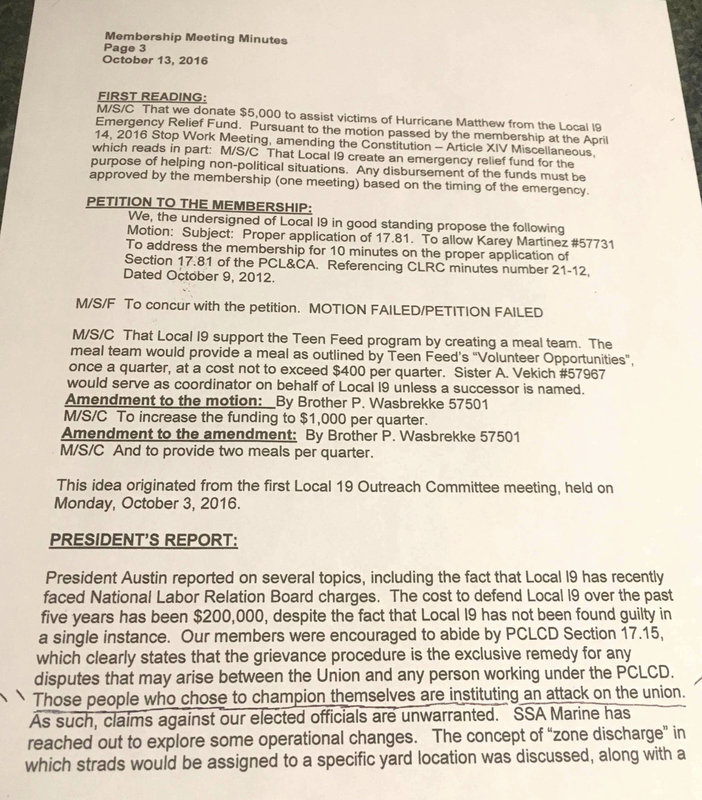 Local 19’s response denying everything will be hard to sell as dumbass Rich Austin put it in writing, in his President’s Report. I for one am looking forward to the Trial, which has been rescheduled to October 24, 2017. Want to bet they settle before the Trial starts? Big Baby has until June 7th to answer, and August 1st to settle, his latest NLRB Complaint. What do you think he will do? 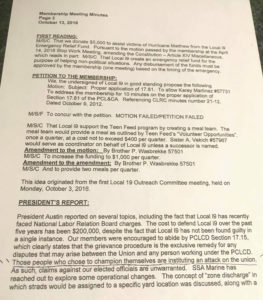 Local 19 Officials, Rich Austin, Kurt Herriage, Justin Hirsch, Ryan Lenz, Paul Wasbrekke, and Dispatcher Robert Denzel, will no longer be able to brag that they have never lost an NLRB case. This is all thanks to Rich Austin shooting off his big mouth, at the October 13, 2016, Union Meeting. Rich wrote down what he said, and what he said is unlawful. Rich is not going to weasel his way out of this one. The NLRB decided that not only is what he said about going to the NLRB being an attack on the Union unlawful, the Region also decided that the language from Section 17.15 requiring the PCLCD grievance procedures be exhausted before seeking other relief is also unlawful. The Union needs to teach their members that the NLRB was established to protect Unions and their members, and “going to the outside” is not an attack on the Union, it is your right. The question of whether or not the PCLCD, and PCCCD, have been printed is of interest because the NLRB wants the language in Section 17.15 changed. Big Baby has until June 7, 2017, to respond to Region 19 and until August 1, 2017 to settle, or go to trial in Seattle at 9 am, August 1, 2017. Is Big Baby going to settle and admit no wrong doing, or take it all the way and give me my first winner, winner, chicken dinner? What do you say Big Baby?